I expected to use data from 2000-2013. 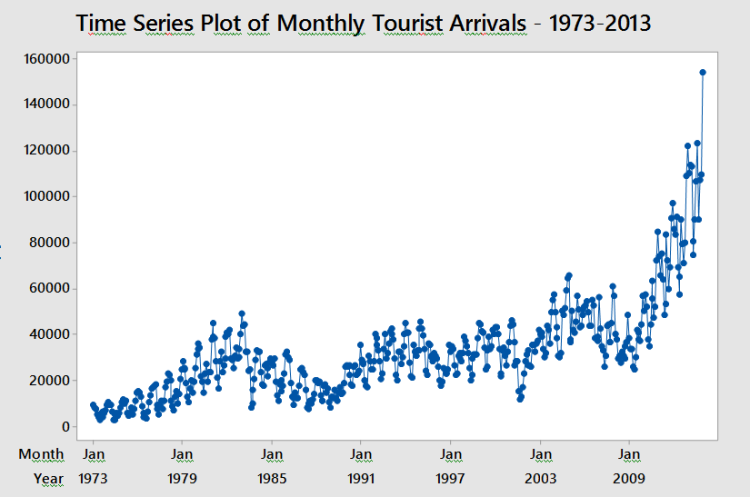 But due to the civil war, the behavior of tourist arrivals is rather different after 2008. Hence I have to use data from 2009 to 2013. But as it is not sufficient in time series analysis I supposed to simulate data. But I do not know whether simulation is a possible solution for my problem. Look into using a transfer function to account for the civil war event. Good topic. I believe Ralph Winters -- ARIMA model link seem to work fine -- labeling the Civil War Event. For a time series, ..if that event as a flag and ARIMA can be generated as was demonstrated. I also believe Differencing will reduce the variance then you can go further fine tuning , event can have its label --Once there was a major issue on differencing when Prof. Box conducted for us Continuing Education class on Forecasting Techniques / Tranfer function models. Stock Market Prices are notoriously event flagged generated extreme values .with full swings in a given week as well.. food for thought .. I'm not very familiar with transfer functions, but if you decide to simulate this data, in R there is a really good function in MASS package fitdistr that uses the Maximum Likelikhood Fitting to find parameters for specific distributions of your choosing. You can then compare the empirical cumulative distribution function of your data to simulated data from the fitted parameters generated by the fitdistr function by using the ecdf function in R.
If you find the fit sufficient, then you can use your fitted parameters to simulate data. There are many resources on the web for this procedure.